Windows. The central pillar of Microsoft and the modern computing world has also been, for the past several years, passingly easy to take for granted. Operating at varying degrees of mundane to tolerable, Windows has been a bore; a groan and a what-can-you-do shrug. No more. With the intersection of PC and tablet interface in Windows 8, Microsoft hasn't just made a gamble on its Metro interface (Microsoft doesn't call it that anymore, but we have for months and will continue to) catching on; it's introduced a whole new set of variables to an overwhelming frontrunner. It's like Usain Bolt going home and training to run the 100m while playing the bagpipes. The degree of difficulty is staggering. The ambition behind it admirable. And the execution? Not half bad. But not quite there yet, either. Using Windows 8 is pleasant, especially if you don't have to do anything in a particular hurry. It's a totally new way of thinking about how you want to operate in a desktop OS—and maybe not entirely in the way you think. But it also seems like a rough draft of a deeply interesting idea. Why does Windows 8 matter? Ha! Ha ha ha ha ha. Simply, this is the first time that you will have to re-learn how to use Windows on a basic level since 1992. Windows is the most central piece of software in the world, and it is undergoing a major paradigm shift. It's the New Deal, for PCs. This is a chance for Windows to really stretch its legs. Windows 7 was a strong, totally acceptable OS. But it always felt like it was making up for the sins of Windows Vista before it. Windows 8 can claim an identity of its own. Moreover, every PC that can run Windows 7 can run Windows 8. That's especially notable, because the system requirements for Windows 7 didn't budge from Vista's. That's three Windows updates in a row all running on the same machines. This is Microsoft doubling down, throwing specs out the window, and trying to deliver performance, good design, and usability. Windows 8 is a dramatic change from previous versions of Windows. But only if you want it to be. The old desktop—basically everything you would see in Windows 7—is still there, with its taskbar and folders and windows. It's still there, but now there's a new layer of the OS that's built around information and visually driven "tiles" that display things like message snippits, the weather, sports scores, or photos. The name for this layer is still up in the air, but we're calling it Metro here. It is designed to be touch-friendly, but it exists in the PC version because Microsoft has merged its tablet and PC operating systems. Even if you're dead-set on changing absolutely no part of your Windows day-to-day while using Windows 8, there's one part stands out even on the desktop: Metro remakes all of your windows. Instead of the glassy, transparent, rounded look of Windows 7 (Aero Glass), the new windows are sharp, with solid colors and cleaner lines. It's a superficial change, but it affects the entire visual makeup of the desktop. The move away from Aero Glass gives apps on the desktop a visual fidelity that has been missing for a long time. Things feel solid. Like they fit together. Like they're not just haphazardly pieced together chunks of pixels and code. And the uniformly colored window panels that fade to gray when they are not selected do an excellent job of drawing your focus to the task at hand. It's an extremely sophisticated boost to the user experience. A nice little bonus is that Microsoft's new streaming music service, Xbox Music, is automatically attached to your account, and active in the default Music app. Think of it as a built-in Spotify. That means you'll literally be able to just start up Windows 8 for the first time and play free music right away. That's a great touch. Don't be afraid of Windows 8. If you don't like using Metro, you really don't have to beyond landing in the tile screen when you boot up; you can think of it as a big, stylish app drawer. Otherwise, you can use the desktop for everything you do now in Windows 7. If you use Metro as nothing more than that, your base Windows experience will still be improved by Windows 8. From the basic level, like the design of the windows to improved security features like the new virus and malware detectors that come by default in Windows 8. For everyone else, it's a fresh start. At the core of Metro is an idea: You don't need all that crap. The 78 plugins on your browser, the half dozen launcher apps you have running in the background, and all the assorted rippers, encoders, notifiers, and shorteners—you can shove 'em. To extend the metaphor, that's not crap that you would keep on your actual desktop. It would be in your junk drawer—the one on the left-hand side of your desk with the rubber bands and the stale Cheetos in it. Windows 8 takes that central idea, incubated in Windows Phone, and codifies it into a hard philosophy with full screen apps that make the insane levels of multitasking we do impractical. You will simplify your workflow. Because we're going to make you. And fine, sort of. But for a traditional computer, a move away from the desktop mentality brings a new challenge. We're tied to the desktop as much for a place to reset as for organization or multitasking. It's a state of rest, almost. It serves as a visual anchor that operating in Metro lacks: There's no place to default to and get your bearings, and maybe figure out where the hell you stuck that app. And without that anchor, as nice as using any specific app is, it can be really hard to reset. Before we go any further, let's get this out of the way: Using a mouse with the Metro interface is actually really great. It's the scroll wheel. You know how you were totally afraid that dragging the screen metaphorically with your mouse is going to be the worst thing ever? Yeah, not actually how it works. You just scroll around from side to side with a scroll wheel, or you can use two-finger scrolling with the trackpad. And while it doesn't make visual sense to open the Metro start screen and just start typing, once you learn the behavior—doesn't take that long—you can use it as a megapowered Start Menu if you really want. That's an especially attractive option if you're using a second display, since you can keep Metro, or a few full screen Metro apps, off to the side, and a whole screen of nothing but desktop on your main screen. Metro apps filling up your screen radically changes how you use them. You can't open a second window of the Metro Internet Explorer, for example. And your Mail and chats and everything else, so long as it's in a Metro app, will all have to live in a single window, though possibly with multiple tabs. That's a radical change from what you're probably used to in other versions of Windows. It's sort of like full-screen app Spaces in OS X, but better: since you can append a second Metro app to either side of your screen that stays put no matter what app you're in. But here's where the visual anchors come in, and they manifest in a few different ways. In OS X, you get a horizontal movement metaphor betwen your Spaces—which includes full screen apps. You can maintain a sense of where you are, and where your stuff is. In Metro, you just sort of zap from one app to the next, with a sort-of shaky four-finger swipe to take you backward. But changing apps without using windows+tab or alt+tab always feels disorienting. It's the difference between walking past a series of paintings on a museum wall and flipping through a slideshow of them on a projector. And it's an issue on a PC because a typical workflow demands a lot more switching back and forth than you'd do on a tablet, where it isn't an issue at all. Being locked into one window in Metro IE (Metro Chrome retains its tabs) is also disorienting at first. We're so used to multi-layered browsing that not being able to toggle between tabs and windows at once, over the same space, seems awful. But give it a chance and the strength of the narrowed down Metro experience manifests. Being trapped in one window really is more... tranquil? There's just less of an inclination to rapid fire off extraneous tabs, windows and searches instead of focusing on what you're reading. And if you want nothing to do with it, again, the old desktop browsers are right where you left them. If you're knee-deep in Metro apps, though, you have some new problems. There is no obvious visual cue as to whether or not an app is open. And unlike mobile operating systems, which don't need to be actively running, say, Mail to pull down your mail, you actually need to have your apps open for them to work properly on a Windows 8 PC . Similarly, the full screen apps make it hard to see what you've still got running, so you end up leaving a ton more apps open than you otherwise would. The display-wide apps are a beautiful effect, but they also give back all the where-the-hell-is-that-window ground that Aero Peek—the transparent look through your windows to the desktop from Windows 7—gained in desktop mode. One of the core differences between a PC and a tablet experience is the number of things you feel like you should be able to do at once. And it's another point where Metro needs to figure out how to make better use of the space it does have. One thing that immediately comes to mind is being able to use more than one sidebarred Metro app. The way Notifications work is indicative of this disconnect. Notifications look lovely, displaying in the top right corner with some information about what just happened, and then fading away. But unlike a desktop environment, when you click through, you're shot all the way out of what you were doing and into another full screen app, just for an IM, or whatever. Twitter, Mail, and Messaging are all obvious candidates for that sidebar slot. I'm sure you can think of others. If you're working in Metro, you can only have one. And maybe some apps should never be allowed to be full screen—like Messaging, which looks absurd taking up your entire display. Windows has had "gestures" for a while now, but that is to say, it's had some bootleg two-fingered scrolling, and whatever off-brand multitouch OEMs cobbled together. But this is its first taste of big boy gestures. As a whole, they perform pretty well. The Charms gesture from the right side of the trackpad is especially wonderful. Additionally, if you're using one of the new convertible Windows 8 computers, or one of the traditional laptops or all in one computers with a touchscreen, you'll find yourself reaching up and touching the screen much more than you'd think. Intellectually, it can be a hard thing to accept if you haven't experienced it, but it's definitely a nice feature to have. The lack of customization in Windows 8 breaks down to two things: a lack of options for you, and a somewhat stunning lack of options for Microsoft. Let's start with the you-facing problems first. Settings need work. Well, more bluntly, Windows 8 needs settings. More of them. Or in some cases, like, any. This is "Uhhh, I don't think you can actually change any of the gestures. Can that be right?" sparse. The other reason behind the lack of options is a little more troubling: Microsoft continues to be unable or unwilling to pull more and bigger partners into its baked-in wonderland. First party Messages on a phone or tablet not having Google Talk or AIM is one thing; we (for now) accept limited functionality on mobile devices. But this is a desktop client that's going to, hopefully, serve as your main chat and communication hub. That can't happen without Google or AIM. The thing about Metro apps is that even though they are mainly pushing an aesthetic and point of view about the operating system, they also hamstring really basic functions. While, stylistically, the interesting answers and points are in design and philosophy and selection and features and everything else, the crux of the issue might come down to something simple, central, and horribly rote: File management. The sad, somewhat predictable truth is that the fundamental act of moving a file from one folder to another—the drag-and-drop action that was probably one of the first three things you learned to do on a computer—is kind of terrible in Metro. How could it not be? But in practice, you cannot, say, drag an image off of a web page and onto your desktop or into a folder. You can't drag files into a media player. All of that has to happen through right clicking and menus and ways of entering information and intentions that are almost entirely anthetical to Metro's manifest destiny of intuitive, natural input and interaction. Going forward, that can mean a few things. Maybe Metro just needs to evolve. This is its first run in a true desktop environment, remember, so it will definitely see things like upgrades to Charm functionality that lets you use that space as a visual clipboard. Or maybe Microsoft just decides to keep the desktop around as a utility belt for when you need to do anything like that—though that wouldn't help much with the problem in Metro apps. The central question surrounding Windows 8 and the Metro UI is this: Will this actually stick as an interface for PCs? We're talking here about the full version of Windows 8, but it's worth taking a moment to touch on Windows 8 RT—especially since it's so hard to tell the difference between the two. Windows RT is the ARM-powered version of Windows 8, and features the same "modern" UI paired with a limited version of the desktop that handles Office apps, Notepad, and simple file management. We've covered its limitations elsewhere, and although it's at first blush practically indistinguishable from full Windows 8, you wouldn't want to use it as a full-on desktop replacement. As a mobile OS, though, the Windows 8 design is instantly addictive and wonderful. Tiles and the pervasive design language of the software were built for touch. But many of the apps, like the aforementioned Messaging and Email, which are central to the experience on any device, still need work. They don't feel as full-featured as what you get from Android and iOS. And even though the start screen's live tiles are supposed to stand in for this, you'll really miss having a notification center. In all the ways that the desktop Windows ecosystem is humongous, mature, and robust, the Windows RT ecosystem in the Windows Store is not. Customers who are accustomed to fully populated stores from Apple, Google, and Amazon will find much missing there. That's RT's primary limitation—and difference from Windows 8—right now, and something to consider. At the very least, wait until the Windows Store fills out its RT offerings a little more before you commit. 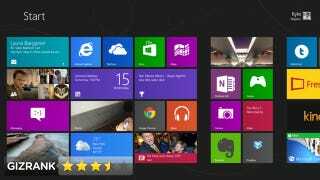 Will Windows 8's New Look Actually Affect You? No, not yet, not if you don't want it to. If you want, you'll be able to operate more or less as you have in Windows 7, with some minor changes, mostly for the better. That's what desktop mode is for. But the writing is on the wall. Nearly all of the features in need of upgrades that have been left largely untouched are associated with the non-Metro desktop and its structure. Real gestures on Windows. That work! Many of you won't have a choice. This is the operating system that will come pre-installed on your PC for the foreseeable future. And that's a good thing! If you're thinking about upgrading, well, that means you actually care about this thing. And if you care about this thing, you should definitely give it a try. Especially for $40 flat and $15 if you bought a PC recently. Networking is cleaner than it has been—the wireless connection pane is now tucked into the Metro sidebar options, and the desktop icon boots you there. It's an improvement. But Homegroups—the "easy" grouping Windows gives you to share files across a home network—are still fairly confusing, and ethernet isn't quite as plug-and-go as it could be. Where your apps go when you're using two screens can get downright confusing. Despite relatively grand promises about how Windows 8 will work on multiple monitors, the way the entire Metro interface slips from one display to the other is jarring. Strangely, the Mail app seems to be bereft of many of the features that make the new Outlook, and even the Windows Phone mail app, so good. Things like threaded messages, joint inboxes, and notifications aren't working yet. Mail is a bigtime app to not be up to par, but that's softened a whole lot by how great Outlook is on the web. Still, Mail needs some updates to be something anyone who cares about email would actually want to use. Other apps are missing strange functions as well—like the absence of a buddy list in Messaging. Overall, there is an over-reliance on the Search charm to navigate you around your apps, to the point where there's no way to search from the Store's home screen. It makes sense that Microsoft wants to highlight its core OS infrastructure, but not at the cost of ease of use. The relative lack of third party Metro apps in the store isn't a huge concern, since release is still more than a month away, but it's still something to think about. A Windows platform will never be as thoroughly ignored by developers as the Wii, or even Windows Phone, but in the absence of Office on the install we received, I am writing this review in freaking Notepad because every other app is a totally broken beta, unacceptably slow (even for you, Evernote), or just plain non-existent. The traditionally bad Control Panel layouts are back just as you remember them too. Category, Large icons, Small icons—they're all terrible to use, and passing comical when you realize that they're nested in a neat, functional new Metro window. It's also totally nuts that you still, after all these years, can't pin a folder to the taskbar in desktop mode. Media-wise, Windows Media Player is just as dumpy as ever. But it generally gets out of your way when you need to play something, and you can always use other, better apps. The real takeaway is how good Music and Videos are. This is a review of the Release to Manufacturing (RTM)—final—version of Windows 8. It was originally published August 15th, 2012, and has been updated to reflect developments since then.